PRC has distributed all available recycling bins to City residents. The City of Pittsburgh does plan to distribute over 10,000 bins in 2019 however PRC is not directly involved in their program. As the leader of the transition to residential recycling bins starting with a pilot project in 2014 PRC continues to support all efforts to modernize the City’s recycling program including the City’s bin distribution program in 2019. 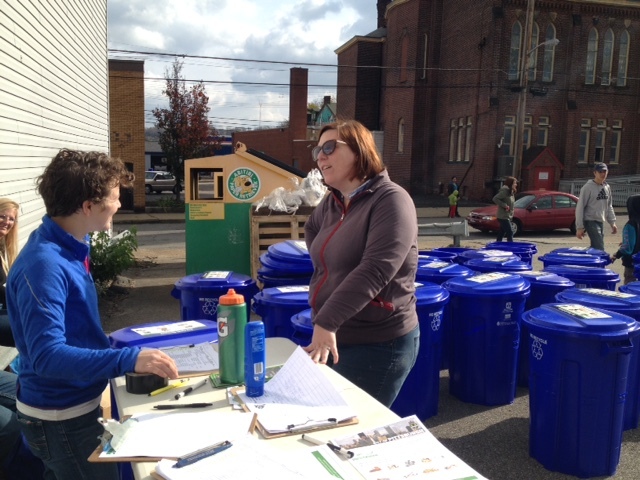 If you wish to join the movement to improve recycling in Pittsburgh and receive a recycling bin you can add your name to PRC’s wait list by clicking the link below. We will notify those on the wait list as details of the City sponsored distribution are available or when PRC receives additional funding for our own program. Currently City of Pittsburgh residents are instructed to place their recyclables in blue plastic bags in designated recycling collection sites on their biweekly recycling pickup day. However, excess plastic bags cause issues at recycling plants (Materials Recovery Facilities or MRFs), clogging the machinery, reducing efficiency, and placing employees at risk. Using bins reduces the need for these bags and increases recycling rates. By placing your recyclable materials, unbagged, in your new blue recycling bin, you’ll help keep valuable materials out of our landfills!